In my intense love affair with the Google Cloud Platform, I’ve never felt more inspired to write content and try things out. After starting with a Snowplow Analytics setup guide, and continuing with a Lighthouse audit automation tutorial, I’m going to show you yet another cool thing you can do with GCP. In this guide, I’ll show you how to use an open-source web crawler running in a Google Compute Engine virtual machine (VM) instance to scrape all the internal and external links of a given domain, and write the results into a BigQuery table. Scope in Google Analytics’ Custom Dimensions refers to how the value in the Custom Dimension is extended to all hits in the same scope. Hit- and product-scoped Custom Dimensions apply to the given hit alone - they are not extended to any other hits in the session or by the same user. Session-scoped Custom Dimensions apply the last value sent during the session to all the hits in that session. Google Cloud Platform is very, very cool. It’s a fully capable, enterprise-grade, scalable cloud ecosystem which lets even total novices get started with building their first cloud applications. 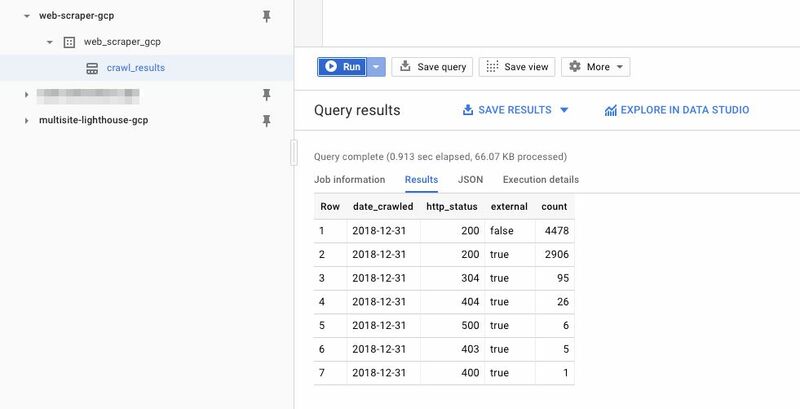 I wrote a long guide for installing Snowplow on the GCP, and you might want to read that if you want to see how you can build your own analytics tool using some nifty open-source modules. But this guide will not be about Snowplow. If you are enjoying the Element Visibility trigger as much as I am, you’ll be glad to know of a very simple tip that might make your life easier when using Google Tag Manager. 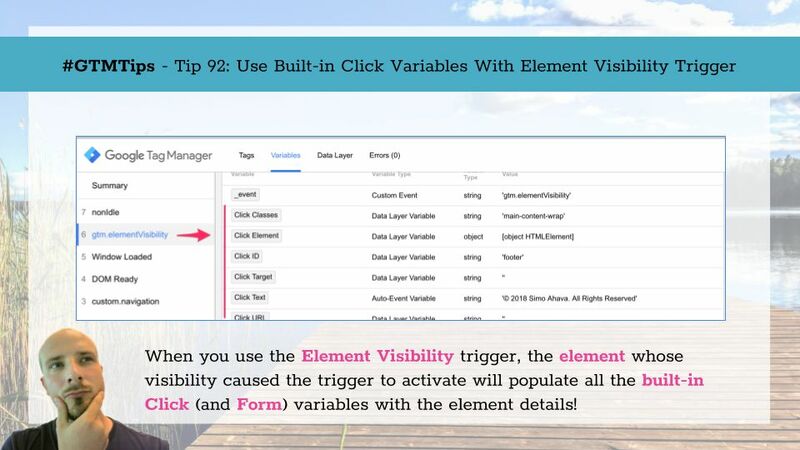 The tip is this: If you’ve activated the built-in Click variables, they will be automatically populated with details about the element that caused the Element Visibility trigger to activate! Tip 92: Use Built-in variables to analyze the visible element Yes, it’s confusing they’re still named Click variables, especially since they’re duplicated in the Form variables, and even more so since they can be used with the Element Visibility trigger to identify which element became visibility. Last updated 18 Jan 2019: Added details about the free tier limitations, and showed how to avoid the Dataflow jobs auto-scaling out of control. I’m (still) a huge fan of Snowplow Analytics. Their open-source, modular approach to DIY analytics pipelines has inspired me two write articles about them, and to host a meetup in Helsinki. In my previous Snowplow with Amazon Web Services guide, I walked you through setting up a Snowplow pipeline using Amazon Web Services. Speaking in front of an audience can be downright intimidating. As a speaker, you are offering yourself for unsolicited feedback and criticism, you will most likely be ridiculed for the vacuity of your arguments, and you will be berated for your rhetoric or told exactly what you did wrong and why, when all you want is to have a cup of coffee, wind down, and enjoy the rest of the event in a good mood. If you’re a user of the free version of Google Analytics, and if you have a free Google Analytics property collecting hits exclusively from the Google Analytics Services SDK (Android or iOS), you might have recently received an email that looks like this (emphasis mine): In a nutshell, Google is now starting the process of deprecating the “legacy” Google Analytics for Mobile Apps. This covers all data collection SDKs that do not have the word “Firebase” in them.